I've pulled the tomatoes out of the ground and brought my tender plants inside. I made bolognese and Brussels sprouts for dinner. All I want to do is make chicken stock and roast vegetables. Fall is here and I welcome it with flannel-clad arms. Let's put on socks and talk about Oscar contenders and our favorite squash. I always said I'd never buy plants that couldn't survive the winter outside but then I went to Rare Plant Research this spring and caved. And then Ricki posted about her Opuntia microdasys 'Bunny Ears' and I had to have one. And then I needed, absolutely needed, an Agave 'Blue Glow' so I bought two. Then the flood gates had broken and I was like, f*ck it, I'm gonna buy a bunch of aeonium and sedum that aren't hardy to my zone. And you know what? I still have room inside! I could've bought way more tender stuff! I could totally squeeze a few smaller pots here! Everything is looking balanced and almost . . . planned. Next year I'm buying everything. Thank goodness we don't have kids or cats. Danger, danger everywhere. Happy fall, y'all! Buy all the houseplants! You have some nice pots. Most of mine are still in black plastic nursery pots... I love your Hawaiian lady picture. That's funny that you mentioned cats. I was feeling so jealous (in an I'm happy for you sort of way) that you could have these beauties in your house without a furry monster destroying them! I miss having indoor plants. I'm taking a break on cats after this one! Whenever Garden Fever has a sale I buy tons of pots. They have the best ones! Greg always reminds of that when I tell him I want a cat or a dog. "They'll find the thing you love most and throw up on it." I guess it's time to bring mine in as well. I've been putting it off...hoping for more warm days.I bought a selection of tender things 50% off at my local !!! Welcome to the club fellow addict! What great light you have for all of your plants! 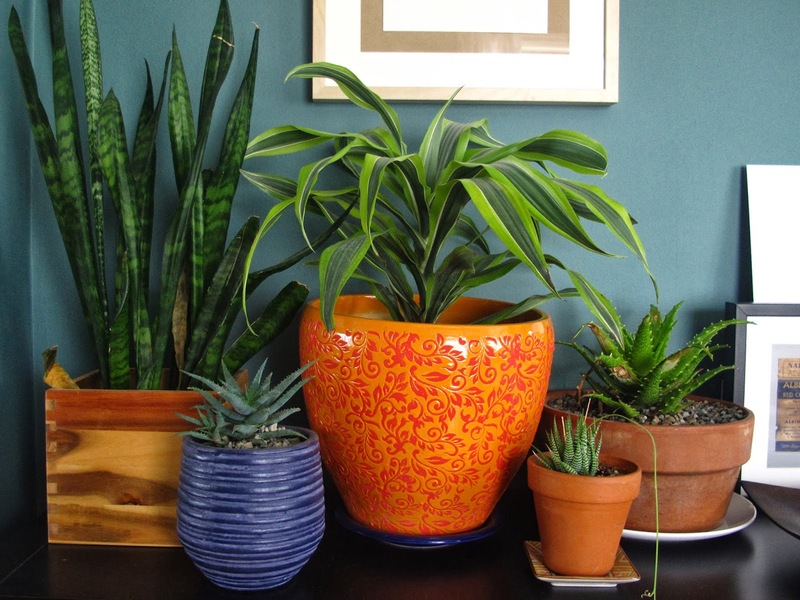 Maybe you can create a winter camp for houseplants for people with crappy light. We ship 'em to you, you collect the money and keep 'em alive, then send them back in the spring and voila! You have more money for more plants. Your inner interior decorator has been liberated! Everything you have done up to this point was simply in preparation for the final touch: PLANTS! They do make for fabulous house plants Heather, especially combined with those gorgeous pots! Nice blue and orange pots! When fall comes the main thing I want to do is bake apple pies. Correction: eat apple pies. Pace yourself! Your tender plant selections look great inside. I wonder how my 2 cats would feel about the addition of an agave here or there? Maybe that would keep the little plant chompers in line! This is how it begins...Soon you'll need a bigger house. BTW, if you have a pet or pets, they will vomit on things so you can blame the wine stains on the pet and it gives you an excuse to buy new rugs as frequently as you paint. How is that a bad thing?